The green shoots of CRE lending are evident in the nascent revival of mortgage originations and CMBS. Yet as CRE and the economy gain momentum, a new SBA study has quantified the sizable and adverse impact of the Great Recession on small CRE and C&I business lending, and recent shifts in bank loan portfolios. Rehashing certain aspects of the credit crunch might feel like rubbing salt in old wounds. After all, the business and mainstream media have gorged on the subject of how lending to small firms - the traditional fount of new job growth in America - severely contracted during the recession. But the latest edition of Small Business Lending in the United States by SBA's Office of Advocacy reveals new contours of commercial bank lending between 2009 and 2010. Clearly, the study's data indicate that the economic shock waves choked off much of the capital supply for an extended period beyond the recession's official close. The study thus substantiates indirectly what small business owners had been claiming for years: loans were effectively closed off for Main Street firms. Small business CRE loans outstanding fell to a four-year low. Outstanding CRE business loans under $1 million for U.S. depository institutions totaled $342 billion as of June, 2010, down 8.0% or a total of $29.8 billion from the previous year. (See the nearby graph.) Total small CRE business loans outstanding stand at their lowest level since 2006. We attribute this decline to the aggregate effect of withering originations, write-downs, and the roll off of maturing loans. On a percentage basis, small CRE business loans outstanding dropped most precipitously last year for the two smallest of three loan brackets: Loans sized at $100,000 or less at origination declined by 16.3% (to $22.1 billion); and loans between $100,000 and $250,000 fell by 11.2% (to $59.6 billion). That said, over 60% of the overall shrinkage in dollar terms ($17.9 billion) occurred in the largest $250,000 to $1,000,000 loan range. By comparison, small C&I loans outstanding under $1 million decreased by only 4.1% in 2009-2010, or a total of $13.3 billion, to a total value of $309.9 billion. These small business loans were partially boosted by a modest increase (2.7%) in outstanding loans under the $100,000 level. Bigger banks trimmed small loans more aggressively than smaller banks. The value of all small business loans outstanding across banks of all asset sizes dropped 6.2%, or a massive $43 billion last year to a total of $652.2 billion. That sum is also at its lowest point in four years. The bigger banks reduced all small business loans during the recession and through the latest reporting period. The value of small business loans outstanding among banks with assets of $1 billion or more collectively dropped 7.1% last year, accounting for $34.1 billion, or nearly 80% of the change in loan value since the previous year. More than $18 billion of last year's reductions were completed by megabanks with $50 billion or more in assets. It follows from these bank-wide cutbacks that riskier small business credits also declined as a percentage of the total value of all bank business loans outstanding. Indeed, that percentage slipped 1.5% last year to a ratio of 68.99% and has been in a steady decline since 2005 when the figure stood at 77.48%. The small business loan ratio for the CRE loan segment, at 40.88% during 2009-2010, was relatively unchanged from the previous year. However, the tiniest CRE loans fared the worst: The ratio of small CRE business loans under $100,000 as a percentage of total business loans outstanding declined by 4.9% last year and has plummeted by 392 basis points, or 26.9%, since 2005. Hence, it appears that small firms that sought modest sums of CRE credit encountered the most difficulty in obtaining or renewing loans. Smaller banks gained CRE market share. We mentioned above that banks with assets exceeding $1 billion reduced their exposures to small business loans to a larger degree than banks with assets under that level. This was particularly the case with small CRE business loans, where the market share of bigger banks plummeted by 11 percentage points in 2009-2010 alone. 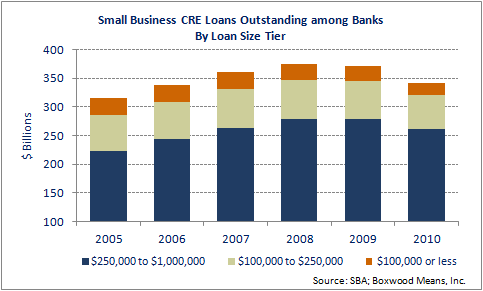 As a result, the concentration of small CRE loans among smaller banks rose relative to the larger banks. The cohort of banks with assets between $100 and $500 million - representing 3,371 banks and the largest number of any asset group - gained the largest market share last year (7%). Among banks of all asset sizes, this modest-sized cohort held the highest proportion of small CRE business loans for two tranches: $100,000 or less (35.4%); and between $100,000 and $250,000 (25.6%). It appears that, given greater financial flexibility and aggressive risk management policies, the bigger banks have generally been nimbler than smaller institutions in dealing with small business CRE exposures. There's also no doubt that the higher small CRE business loan concentrations among smaller banks seem problematic. But at the same time, it signals an unwavering commitment by local and community banks to small business borrower needs. Big banks remain the 800-pound gorilla. 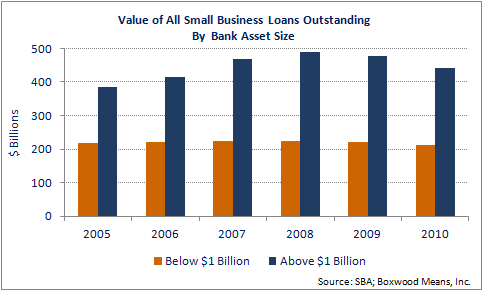 After all is said and done, including steady reductions over time in the value of small business loans outstanding, banks with more than $10 billion in assets remain the predominant players in the small business lending space. While representing only 1% of the 7,224 total depository institutions, this elite group commanded nearly half (48.3%) of the aggregate value of small CRE and C&I loans outstanding under $1 million during 2009-2010. The multi-billion dollar banks are thus a formidable force in small business lending; and their recent initiatives to expand lending in the space highlight both their renewed, if not belated response to the needs of small business owners and borrowers. Indeed, the study findings underscore that the threats to financial stability imposed on all banks by the Great Recession lingered even after the recovery in the U.S. economy, resulting in an extended period of contraction in small business loan portfolios.